Crude prices marched up this week, finally re-attaining the psychologically important $50/b level for the first time in three weeks. Prices opened higher four days out of five this week. The upward trend in crude and product prices has plateaued this morning, with some pre-weekend profit taking, but the week appears to be on its way to a solid end in the black. WTI crude prices opened the week at $48.12/b. 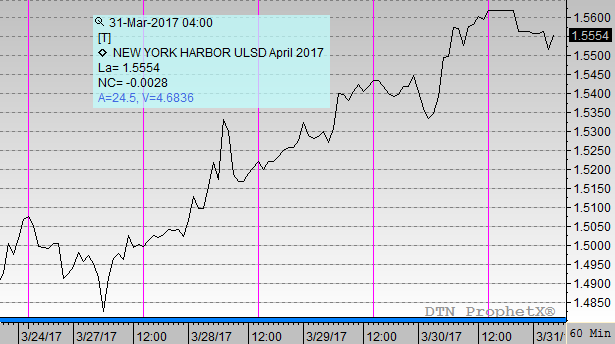 WTI opened this session at $50.32/b, a major increase of $2.20, or 4.6%, from Monday’s opening. During the week, prices ranged from a high of $50.47/b on Thursday to a low of $47.08 on Monday, a range of $3.39. Current prices are $50.23/b, down $0.12 from yesterday’s close. Diesel prices opened Monday at $1.5028/gallon. Diesel opened this morning at $1.562/gallon, a significant increase of 3.9%, or 5.92 cents, for the week. Prices ranged from a high of $1.5627/gallon on Thursday to a low of $1.4763/gallon on Monday, a large price range of 8.64 cents. Prices currently are $1.5554/gallon, a decline of 0.28 cents from Thursday’s close. Gasoline prices opened Monday at $1.6109/gallon. 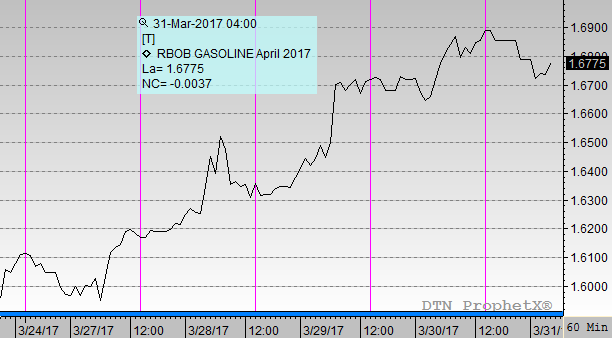 Today, gasoline opened at $1.689/gallon, a major increase of 4.8%, or 7.81 cents, for the week. Prices ranged from a low of $1.59/gallon on Monday to a high of $1.6919/gallon on Thursday, a large range of 10.19 cents. Prices are $1.6775/gallon currently, down 0.37 cents from Thursday’s close. This week’s EIA data showed several developments that were constructive for prices. First, although there was another increase in crude inventories, it was relatively small at 0.867 mmbbls, and it was overwhelmed by drawdowns of 3.747 mmbbls of gasoline and by 2.483 mmbbls of diesel. Crude runs jumped 425 kbpd as numerous refineries came out of Spring maintenance. Crude exports jumped, whilst crude imports remained roughly unchanged. The news from OPEC continues to bolster prices. Reuters reported that output from two key oilfields, Sharara and Wafa, in western Libya was constrained by renewed violence, taking around 250 kbpd off the market. OPEC compliance with the production cut agreement is high, though compliance among the Non-OPEC participants is lagging. Nonetheless, the agreement is only three months along, and the participants are considering an extension of the cuts. The possibility that this could be achieved received a boost when Iran and Russia held discussions regarding continued cooperation in the agreement. Russia has not yet fully cut the 300 kbpd to which it has committed, and Iran had been granted leeway to continue to increase production modestly (which it has done.) Therefore, these two countries could contribute considerably more to the OPEC-NOPEC agreement, and their implied willingness to do so adds weight to the pact as whole.